I was pretty pleased when Target added Napoleon Perdis Set, Pixi by Petra and Jemma Kidd lines of makeup. Ok, I was more than pretty pleased, I was down right running-through-the-streets-screaming ecstatic. Since then, I have sampled my way through each line, happy with the prices and the availability. After all, there's nothing better than running to Target to pick up some Wheat Thins and Oreos and snapping up a fantastic red lipstick by NP Set as well. However, this really takes the cake. While perusing for some rubbing alcohol today (ok, I admit it, I was looking for makeup. But I did also need some rubbing alcohol for brush cleaning. 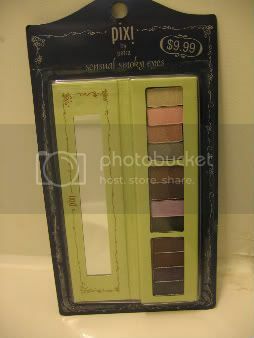 Recipe will follow later) I found a gift set- eyeshadow palette in No.2 Sensational for $9.99. Yes, that's right. Less than ten dollars. It's a delightful sampler of colors all slightly shimmery. 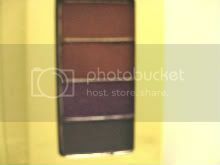 I was especially impressed by indigo specked with plum shimmer, copper and black shadow specked with navy shimmer. 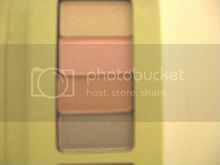 Also in this collection of colors, were lavender, peach and an iridescent pale yellow. 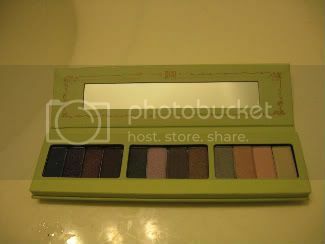 There was also another palette that contained more neutral colors, and I could hardly pick between the two. It comes in this neat little magnetic case, the super slim packaging means that it travels well in any purse or cosmetics bag. I love samplers, being able to have lots of colors to play with is so much more fun than committing to one color. 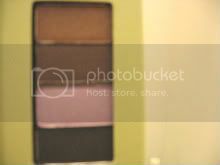 Besides, there are an infinite amount of looks you can do with a dozen shades! Then, if you decide you simply can't live without one of them, you'll know where to find it, and it crosses over to a Must item. Cost: $9.99 at Target. But at these prices, I couldn't part with it, there's no way I'm giving it away as a gift. Here's some of the looks I concocted. 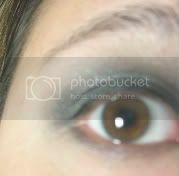 The first being the basic smoky eye, really simple. Urban Decay Primer Potion as the base, then I used color number 5(from the left) a pearly charcoal in the crease with a small eyeshadow brush, then number 1, a black with navy shimmer from my lash line to the crease. Color number 11 went over my brow bone and blended it with a clean fluffy brush. Color number 1 also went along my lower lash line, smudged with a small angled brush. Liquid black eyeliner across the upper lash line completed the look.